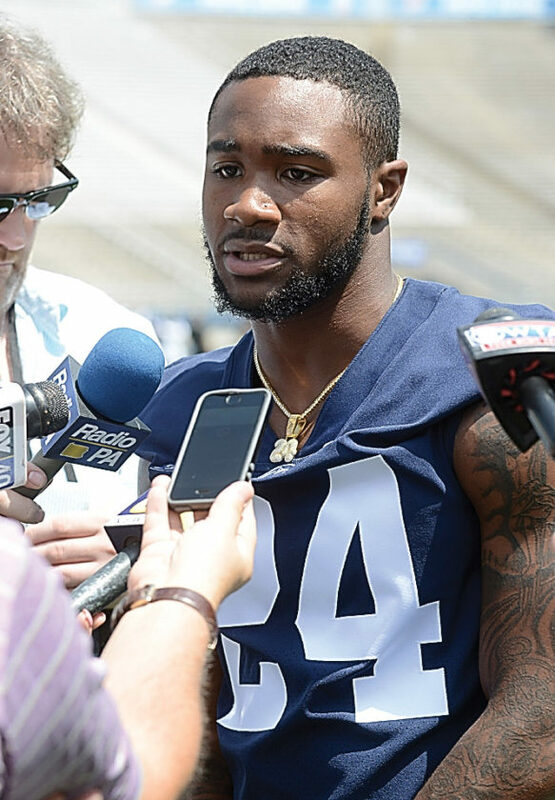 08/04/18 Mirror photo by Patrick Waksmunski / Penn State running back Miles Sanders answers questions during media day. UNIVERSITY PARK– Miles Sanders has waited his turn. He’s been patient. Worked hard behind the scenes. Learned what he could. Said all the right things. He was the nation’s top running back recruit coming out of high school, but it just so happened that Saquon Barkley, the best running back in Penn State history, kept Sanders from getting much of an opportunity the past two years. Barkley’s now in the NFL, and it’s time to find out what Sanders can do. He was asked exactly that during media day Saturday: What can he do as Penn State’s starting running back. Barkley certainly left big shoes to fill, but Sanders knows he now has a chance to create his own legacy with the Nittany Lions. And what exactly can he show them? In a lot of ways, the Barkley-Sanders situation is how college football is supposed to work. A kid dominates in high school and has a chance to be a college star, but first he has to learn from an established veteran already on the team. Alabama has been the perfect example of that for years, with such remarkable depth that it allows prized recruits to come in and learn the ropes from upperclassmen. The young guys don’t have as much pressure right away, which gives them time to develop physically and mentally. ?Sanders has gotten some playing time the past two years, but by and large that time was spent watching Barkley and learning from him. “I just sat back and saw how Saquon handled it. He handled it pretty well,” Sanders said. Sanders had 31 carries for 191 yards and two touchdowns last season, after getting 25 carries for 184 yards and one score as a true freshman in 2016. He’s also caught eight passes for 54 yards and one touchdown over the two years. This season, Sanders likely will be getting close to 20 carries per game, and anything less than 1,000 yards rushing would be both a surprise and a disappointment. “Obviously very talented guy,” coach James Franklin said. “Been very fortunate to have an opportunity to practice and train and learn from and learn with Saquon Barkley, and now is his time. Franklin also praised Sanders’ maturity and steady performance since he arrived on campus. Sanders said he has evolved a lot since getting to college, and the first step was figuring out he couldn’t succeed simply on talent alone like in high school. One of the things that made Barkley so good at PSU was his outstanding pass-catching abilities. Sanders has a long ways to go in that regard, and he knows it. That doesn’t just mean on the field, either. Barkley was a tremendous leader on the squad, something else Sanders was able to watch the past two years so that he can assume that role. 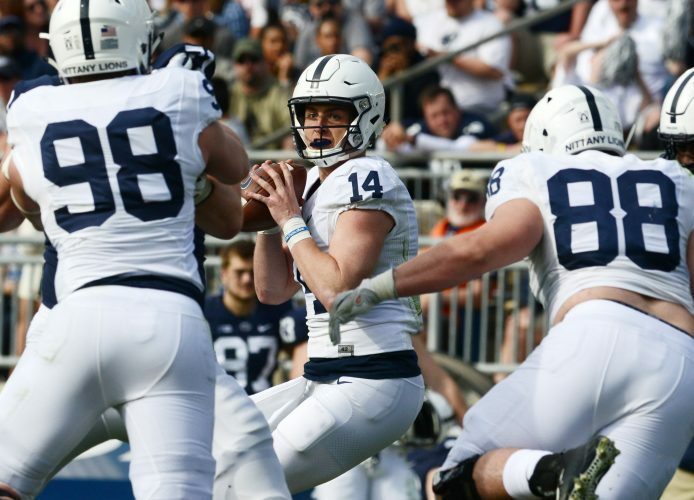 “The one thing I’ve seen from Miles that’s changed is he’s assumed a leadership role, and that’s been really, really good,” offensive coordinator Ricky Rahne said.